Foggy air and cold breezes lets us know that the cold seasons are finally at our door. The temperature is going to drop once again. And if you hate these seasons or you just hate feeling cold every time you walk outside the door, then there are some great ideas out there that’ll help you out. And if you want to enjoy these cold months without getting sick, then these 10 hacks will come in handy. You can look fashionable and feel warm at the same time. 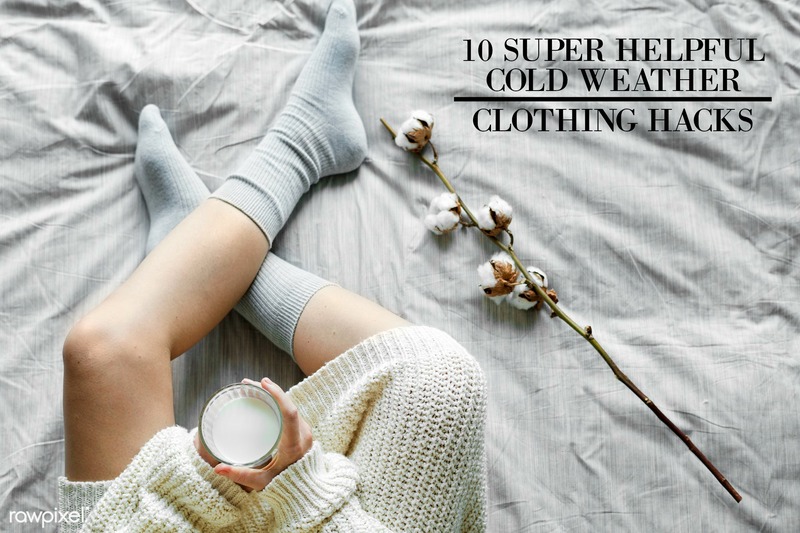 So stay cute and cozy by following these fantastic ten cold weather clothing hacks! How to wear warm clothes. We love that warm feeling of cozy clothes. And if you’re going to head out of the house in 30 minutes to an hour, then put them in the dryer so you can be extra warm when heading out. Fiber hats to the rescue! Synthetic fibers can give you hat hair. But knitted hats which are made of natural fibers such as wool or cashmere, can keep your hair looking nice. If you have a favorite sweater (or sweaters) that keep you warm in the cold, don’t fold them. Hanging is the best way to keep them around. Mittens are actually better than gloves as mittens help your hands to keep warm. Your hand can stay warmer if your fingers generate warmth from skin to skin contact. You can wear tights under your pants to keep your skin warm. So if you want to wear some stylish jeans this winter, then put some leggings or tights underneath. How to keep your feet warm. People usually prefer to wear warm socks to keep their feet warm. And we’ve found another fantastic hack. You can line your shoes with wool felt. This one is quite simple and a great organizer. You just have to put pool noodles in your tall boots to keep them organized and lasting longer. They’re inexpensive too! How to deshrink a sweater. If you accidentally shrink your beloved sweater, then don’t worry. Just mix baby shampoo in lukewarm water and let your sweater soak for at least ten minutes. It’ll relax the fibers. Keep the sweater flat until it completely dried. How to clean matted suede. A suede fur jacket looks super cute in this cold weather (and so do suede boots). But what do you do if they get dirty? Just get a bristle toothbrush, then start brushing it but don’t rub it too hard. Keep in mind that it’s delicate. It’ll look like new very soon! Now if you have any questions about these cold weather hacks, just let me know in the comments down below! I’d love to help you out!